This is marketing at its finest. The lack of gears is being sold as a feature, not a bug! 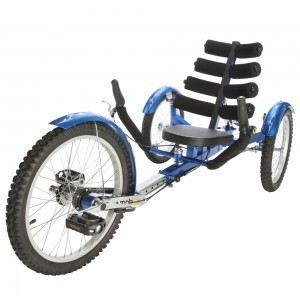 Yes, it’s a fixie, recumbent trike! I’m guessing there may be two or three people in Florida who want to buy one of these things. And being able to back up is a feature? Did you ever hear of pushing the trike backwards? If anyone has access to the sales volume of HS, I’d love to know if they sell any of these. Maybe some bored Arab sheiks are buying them to help their servants service the camels?!? I’m sure HS has more gems in their vast catalog, but I think that is enough for now. This entry was posted in Oh, Sharper Image and tagged Hammacher Schlemmer on October 24, 2014 by Gary. I noticed that this thing, and a host of other unimpressive, overpriced WheeledThings, are available from the Sharper Image (or from the website of whatever bottom-feeders purchased the Sharper Image web domain out of bankruptcy). I’ve added a “Sharper Image” tag to go with Hammacher Schlemmer and SkyMall.